This week we’re going to think big. Bigger than big. We’re going to consider the biggest things in the Universe. If you could pull way back, and examine regions of space billions of light-years across, what would you see? How is the Universe arranged at the largest scale? And more importantly… why? Dr. Pamela Gay: Yup the subject that puts dread in the hearts of many, many an undergraduate. Fraser: Isn’t that like there’s only three people in the world who understand quantum mechanics? Or is it no anyone who tells me they understand quantum mechanics doesn’t understand quantum mechanics? Pamela: I think string theory there’s only three people who can do the math. With quantum mechanics there are lots of people that can work the equations but in terms of being able to completely internalize it and have their stomach do it. Fraser: Alright but you’re getting ahead of us here. So let me do my official introduction and we can go from there. Quantum mechanics is the study of the very tiny; the nature of the reality of the smallest scale. It is a science that defies common sense and delivers no helpful analogies. Yet it delivers the goods making scientific predictions with incredible accuracy. Let’s look into the history of quantum theory and then struggle to comprehend its connection to the universe. There, so if I was [laughter] to go and find some physicists and corner them and say – oh, I’ve got one right now – and say what’s quantum mechanics? [Laughter] What kind of answer would I get? Pamela: I think the most straightforward description of it is: a way to using equations that work, describe just about everything as simultaneously being a wave and a particle while making your head really hurt. Fraser: Okay, depending on how big their ego is and how well they think they understand it it’s a way mathematically. What kind of things can you mathematically describe with quantum theory? Pamela: The entire spectrum of an atom can be described in very detailed ways using quantum mechanics. I can go out and use a telescope to observe hydrogen in many different states all across the universe. I can understand the 21 centimeter line as a very rare flipping of an electron. I can understand the different emission lines that come from hydrogen gas that’s heated to different temperatures as a function of the electrons jumping from one energy level to another. I can understand how light gets absorbed by gases and scattered in different directions and how lasers and masers work. All of that comes out of quantum mechanics. I can very precisely come up with all sorts of crazy numbers that describe how molecules vibrate. It all works. That’s the amazing crazy part about this is it all works. Fraser: Right, if you plug in the numbers you get an accurate description of reality even though what’s actually going on is defying logic at every turn. How did quantum mechanics come about? Pamela: It basically came about from I think this was the original case of someone doing an experiment, having something really crazy come out of it and sitting in their chair and letting out a string of expletives. There were things like if you shoot an incredibly intense beam of red light at a metal plate. The metal plate goes yeah, so, okay and does nothing. But if you shoot higher energy blue light at that same plate you can get electrons getting shot off. The thing is you don’t even have to use as intense a blue light. The intensity of the light seemed to have nothing to do with what was going on. It had to do with the color of the light. This was finally explained by Einstein with what we call the photoelectric effect where suddenly the light was no longer this continuous intense sea of energy but rather it was discrete packets where the amount of energy in each individual packet was related to the color. That was a revolutionary idea. It forced us to change how we think of things. All of a sudden it was no longer light spreading out in this thinning sea as it radiates away from the sun. Rather it is a bunch of individual photons where the space in-between the photons increases as you get further and further away and the light is forced to spread itself out over a greater and greater area. All of this was new. Most fundamentally, the idea that light could only have certain energies. That was something completely expected that turned out to again be completely true. Fraser: How did the first early physicists wrestle with this? Pamela: There were lots of different things that they had to figure out. The first thing that probably got sorted out is that electrons can be bent with electromagnetic forces have very small masses. When they hit fluorescent screens they can give off light. A cathode ray tube was one of the first experiments that forced us to start thinking about electrons as discreet little packets and starting to understand how they worked. Fraser: What’s going on in the CRT? Pamela: Basically you accelerate an electron and we didn’t know that this is what we were doing the first time scientists started doing this. You create as complete a vacuum as you can. Then you do various things that cause electrons to be created. You accelerate them through charged plates, through capacitors. Then by adjusting magnetic fields you can change where on a fluorescent fluorescing plate that electron hits. By adjusting magnetic fields in the electric fields that you’re using in this system you can actually measure the mass of an electron. When we first measured it and realized that it was fractions, thousandths of the mass of an atom we realized, wow electrons are these discreet little tiny particles that are extremely small but look at the things we can do with them. Fraser: But where does the quantum mechanics part of it come into that story? Pamela: Once we started thinking of things as little tiny here we have an electron, here we have photons, we started probing what is the structure of the atom. It was originally thought that atoms were basically – it was the plum pudding model where you had the protons and the electrons all kind of randomly globbed together. There were experiments done where beams of electrons were sent into a gold foil. Had the structure of the atom been a plum pudding basically, where you have these randomized plums – the electrons and protons – randomly scattered through the atom you would have gotten one set of the way the electrons get reflected as they go through the gold foil. Instead what we saw was a scattering that could only be explained if the protons and neutrons were concentrated in a very small nuclei surrounded by a huge swarm of an electron cloud. This started making us think about what is it the electrons are doing if they’re orbiting? There were problems with if the electrons are orbiting why aren’t they constantly radiating energy? They’re constantly accelerating because they’re moving in a circle. This started to become very problematical. It was in trying to sort out that problem and in looking at the allowed wavelengths of light where we also ran into problems there of as the wavelength gets shorter and shorter the amount of energy should go to infinity. All of a sudden we have warm objects giving off infinite amounts of light. This is the ultraviolet catastrophe. It’s the way it was referred to back in the days before we really knew about x-rays and gamma rays. In trying to sort out all these different problems people eventually settled on the well we can solve this if we start looking at energy as being quantized, of there being certain limited values allowed where you can’t have an infinitely small wavelength. Eventually you just run out and things go to zero in the ultraviolet. So the energy goes to zero and the wavelength becomes infinitely small. We were able to solve these problems by doing something extremely unsatisfying and saying energy is discreet and can only have certain given values. Fraser: When you say energy is discreet and can only have certain given values this is the quantum part of quantum mechanics, right that energy comes in packets of a very specific amount. That’s a quanta, right? Pamela: Yes and this is where we say energy is equal to a constant times the frequency of the light. It’s that constant that’s always in there and never goes to zero that gives us the: you’re only allowed certain values. Fraser: Then the smallest theoretical amount of light you can have is one packet, right? Fraser: So you get zero and then you get one but you can’t have fractions between. That’s good because if you had fractions you would have an infinite amount of energy pouring out. Pamela: Yes and we don’t so we’re fine. Then we also started having all these other weird things. De Broglie was one of the ones who noticed that electrons have wavelengths too. We were not happy but could almost cope with the concept that light is both a particle and a wave. It has no mass, it acts in weird ways, it hurts but okay we can move on from this. Then we started realizing as a field – and I wasn’t born yet – that electrons which have mass also can have wavelengths and can interfere with each other. One of the things we knew is you can take beams of light and send them through slits and get amazing patterns on the wall, interference and diffraction patterns. This has to do with the wave nature of light. The same way waves going through rocks going towards the shore you can end up with a completely straight wave hitting these rocks turning into perfect sections of a circle radiating away from the slit through the rocks. Fraser: We did a whole show on this with our wave particle duality so I know we’ve got sort of all the details on that if people want to listen to that show. Pamela: People started doing experiments, oh dear electrons interfere as well. Fraser: What would be the apparatus? What would be the experiment to see an electron interfere with itself? Pamela: Here’s the cool way that you do it. If you have thin enough slits and you send beams of electrons, one electron at a time through the slit you instead of getting two perfect images of the slit on some screen in the distance – which is what your stomach would say should happen, you shine electrons on a slit they go through the slit, they hit a detector on the back, and you get an image of the slits. Fraser: Right they either get bounced because they hit the sides of the slits or they go right through the slit and you get them hitting the detector. Pamela: Yes, no big deal. The reality is that when the electrons one at a time, not having anything else to deal with, but one at a time pass through these slits it’s like they know that there’s other electrons coming. They go through and over time they’ll build up this interference pattern on the detector just as though there were a whole series of waves interfering with one another. Fraser: You’ve got an electron going through both slits at once? Pamela: And interfering with itself. Fraser: And interfering with itself to create this pattern. Pamela: It’s a probability function. This is the really weird thing. It’s so cool and we’ll see if we can find an animation to put up on our website. It’s so cool to watch this happen. You’ll see on your detector a flash of electron hit over to the left. Electron hit directly in line from the slit. Electron hit over from the right; another electron over on the slit. They build up over time and it is one electron at a time that they build up this interference pattern. They build it up with a perfect distribution of the majority of the electrons landing where you have the highest probability. Fraser: This is the same pattern that you see with photons but it is quite astonishing you see it with electrons, right? Pamela: And they did. This was when we started to realize that the actions of light and particles are dictated by probability. Electrons are just like light, capable of somehow knowing hey I’m a wave I’m going through slits. I should interfere with something and that something may be coming later. [Laughter] That’s just cool. Fraser: Yeah, now you can keep going, right? You don’t just stop with electrons. Pamela: No. What ends up happening is as you get to larger and larger physical objects their wavelengths start being smaller than they are. The wavelength of a human being is way smaller than a human being. You can’t send me through two slits and have me interfere with myself on the other end. At a certain point you stop being able to run these experiments because the wavelength and the physical size just doesn’t quite allow that to happen. Pamela: Yeah it doesn’t make any sense. Then there are other consequences of quantum mechanics that we’re still rather uncomfortable with. One of these is the Heisenberg uncertainty principle. The idea behind this one is waves carry energy in them. They carry momentum. As a wave is traveling through space if it hits something it can impart that momentum and do work basically. If I want to measure the rate at which that wavelength is traveling through space and I want to measure that wavelength very, very precisely I’m kind of stuck. I’m only able to either know its momentum very precisely or its position in space very precisely. I’m not actually allowed to know both of these very precisely at the exact same time. The way to think about it is if I concentrate its position into a point then I no longer know anything about its wavelength. All I know is all of the light is right at this point right now that’s all I know. Suddenly the wavelength information is completely gone. But if I very carefully am able to determine its wavelength somehow what I’m looking at is the period oscillations of the electromagnetic wave. That doesn’t have a central point. That doesn’t have the specific position. This means basically I can either know exactly where the wave is or I can know exactly its wavelength but don’t ask me to tell you both at the same time. Fraser: The same thing goes with an electron going around a proton? Fraser: You can know its momentum or its position? Pamela: Yes and you can’t know both. This applies to lots of different ways of looking at these particles. We have the most common way of looking at it is looking at it in terms of position momentum. We can also look at in terms of energy in position. Energy is another way of looking at wavelength. We’re trying to sort out what’s going on and we keep coming up against the well you’re not allowed to know something. We also have once we start looking at things in terms of relativity we start running into energy and time uncertainties. All of these things tie together and it leads to a place where we can only know half the information at any one point. Anyone who is deeply in love with kinematics and the notion that if you know the position and velocity of everything at any one moment you can predict to the complete unfurling of the rest of the universe. The uncertainty principle says I can’t know that. Fraser: Right, it’s not just issues of your instruments aren’t good enough. No instruments could ever be made good enough to know those two pieces of information at the same time. Pamela: Yes, it’s just the universe doesn’t allow it. It’s the way it’s wired. There are different ways of cheating the system. There was a really neat experiment done – the understanding of the experiment is still being debated – but the experiment itself is really cool. If you have one of these double slits and you shine light through it you get this wonderful interference pattern on a wall. You can very carefully arrange thin wires between the double slits and the wall where those wires fall in the shadows of the fringe pattern. Putting them there doesn’t affect what you see in any way. If you put a lens between the slits and the wall the lens treats the light as though it was a bunch of particles. As far as a lens is concerned light is a particle. It will actually take that pretty diffraction pattern and get rid of it and make two images of the slits on the wall. You go from pretty diffraction pattern to instead slit and slit nicely glowing like your stomach expected you to see originally. If you do this experiment putting the lens in after putting these wires in you still won’t see the wires in the pretty slits. If you cover up one of those slits so that the interference is no longer happening suddenly in the image of that slit you didn’t cover up you can see the shadows of the wires. So the light knows it’s no longer interfering. Fraser: Right and this is after it’s already gone through the slit and so you’re blocking it between the slit and the detector – the slit in the wall. Pamela: No, you actually do block it before it goes into the slit. Fraser: Okay you block it before it goes through the slit. Pamela: Then suddenly the interference pattern is no longer there. It’s kind of creepy that you can have the light in terms of the wires knows that it’s supposed to be interfering. Then that interfering light hits the lens and suddenly goes oops I’m going to be a particle now. You’re able to basically flip it from behaving like a wave when it is interfering with the shadows and the wire to acting like a particle as it passes through the lens. That’s just cool. You can mess with your own head while messing with light. Fraser: I know that quantum mechanics is sort of beautiful and works really well and is very well supported by mathematics. Yet it’s a real thorn in the side of the folks trying to unite the forces of the universe, right? It won’t behave and if you try to bring gravity down to the realm of quantum mechanics the two don’t get along. Pamela: Yeah, one of the problems that we run into is quantum mechanics is able to deal with predicting how energy is partitioned between thermal energy, between kinetic energy. It allows us to understand how gases behave. It allows us to understand transitions of electrons and atoms, the vibrations of molecules. As you increase the density of the system it allows us to continue understanding what’s going on through quantum mechanics and thermodynamics getting brought together where you can start to understand that if you can pack a system dense enough like in a white dwarf star suddenly all of the electrons go okay, poly-exclusion principle. Poly-exclusion principle says electrons have to be oriented in two different orientations as the orbit in the same energy of an atom. We call this spin-up and spin-down just because the electrons aren’t actually spinning that we know of. It’s just a convenient way of thinking of the electrons. You can imagine it one north pole up one north pole down as they rotate. They aren’t doing that, it’s just a way of envisioning it. If you have to pack electrons tight enough suddenly it’s not just the electrons in energy levels around this atom, atoms electrons in orbits around those atoms over there. Suddenly it’s all the electrons basically forming one lattice-work of energy levels carefully obeying the poly-exclusion principle as they form what we call a degenerate gas. All of this works with quantum mechanics. As we continue to crank up the densities making neutron stars now suddenly it has realized oh shoot can’t have electrons and proton this close together, must combine and they combine to form neutrons. We can explain how the energy, how the mass is all conserved and what gets shot out during the process. We can explain neutron stars. When you crank things up further suddenly quantum mechanics can’t explain what happens when neutrons are no longer able to exist. When the densities get so high that even the neutrons kind of give up the ghost and say okay I’m going to be something different now so that I take up less space. What that different thing the neutrons become to take up less space and form black holes, quantum mechanics can’t go there. Quantum mechanics has no way of addressing gravitational effects. This is one of the things that I’m hoping gets solved in my lifetime because there’s a way of viewing the universe where gravity is geometry. There’s a way of viewing the universe where gravity is still part of particle physics where it is conducted by the flow of gravitons. We don’t know which view is fully true or if both are true. We have geometry and particles the same way we have the particles and wavelengths. I don’t know how once we’ve discovered the Higgs-Boson and once we’ve discovered the graviton if we discover those things we’re going to describe to some future generation of physicists the way the universe is shaped. Fraser: I guess at the same front you can’t take quantum mechanics and scale it up beyond a few collections of atoms? Pamela: That’s where we start having to deal with what we call classical mechanics where we start describing things in bulk motions. Suddenly things behave in ways our stomachs understand. Fraser: Right, there’s no uncertainty about the orbit of Jupiter. Fraser: You can predict it in that situation it really does just come down to the quality of your instruments. Pamela: We have this weird universe where when things start moving too fast or their masses get too large suddenly we have to turn to Einstein. Then when you go the other direction and you start dealing with things that are extremely small you have to start using quantum mechanics. In that middle land you can use Newtonian mechanics and our stomachs understand the planet Earth and most of the physics we have to deal with day to day. Fraser: The thing that I like about quantum mechanics and I can only assume because I barely understand it is that it is one of those sciences that really defies as you say your stomach understanding. It won’t let you intuitively progress making analogies in your mind and kind of well it ought to be like this because [laughter] this makes sense to me. I’ve seen rocks fall and I understand how if I swing something around my head it goes in a nice circle and all that king of stuff. Your intuition is worthless and you have to throw it out. You have to just say I’m just going to start performing experiments and I’m going to see what the experiments tell me and I’m going to accept the results and that’s that. I find that whole thing really refreshing because if you listen to this show we don’t have like a single analogy. There’s nothing. Sometimes how your mother is sometimes like a particle….no that [laughter] doesn’t work. There are just no analogies, nothing that can help you out on this. You have to just listen to nature and listen to the experiments and follow the math. That’s the only kind of progress that you can do. I think that’s great because I think that so much science – although scientists really try to progress and try to be objective and just listen to their experiments and so on – a lot of that personality experience gets brought into it. This is one of those situations where nobody’s got any sort of opinion on it. I guess maybe they build up opinions about one theory and another theory but in the end really just the human being has no evolved way to deal with it. I really like quantum mechanics. We’ve got a few other topics that we wanted to really go into in this area so I think we’re going to spend a couple of shows and talk about some of the really interesting things that have come out of quantum mechanics. One being entanglement, spooky action at a distance and we have a couple of other things we want to talk about as well, especially how it relates to astronomy so we’ll get on with that in the next couple of shows. Thanks Pamela. Fraser Cane: Hi Pamela, are you ready to think big? Dr. Pamela Gay: I hope I am. Fraser: This week we’re going to think really big. Bigger than big, we’re going to consider the biggest things in the universe. If you can pull way back and examine regions of space billions of light years across, what would you see? How was the universe arranged at the largest scale? More importantly why? Let’s think small for starters. We’ve got the Earth going around the sun. The sun is a member of a spiral galaxy called the Milky Way, then what? Pamela: Then we belong to the local group, which is this little tiny group of galaxies. It’s pretty much us and Andromeda and Triangulum. It’s a little tiny system. Fraser: This is the only time you get to describe a collection of galaxies [laughter] as tiny. Any other time gignormous I believe would be the word you would use. Pamela: Right so the thing is on the grand scheme of the entire cosmos our local group, which is mostly made up of dwarf galaxies but has a few other big galaxies, like I said us, Andromeda and Triangulum are tiny compared to what’s out there. Fraser: Okay let’s get a sense of scale then. How big is our local group? Why do we call those galaxies the local group? Pamela: Gravitationally we’re all bound together. We’re all part of basically a swarm of systems that are happily orbiting one another. They will happily one day consume one another as we grow into a bigger and bigger pile of mass with fewer and fewer discreet objects within it. Our small groups of gravitationally bound together galaxies are slowly moving toward other much larger collections of galaxies that we’ll later fall into just because their gravity is that much bigger. Fraser: Like the Milky Way we’re all kind of collected together into the local group. I know Andromeda is like two and a half million light years away so that’s kind of the scale that we’re looking at here. There are dozens of dwarf galaxies as well. Fraser: What are we moving towards then? Pamela: We’re on the outskirts of what is called the Virgo supercluster, which is our local supercluster. It is the big city that we are basically currently a suburb of. As city sprawl takes over, that city is going to slowly consume us except in this case instead of the city growing bigger the city is actually gravitationally sucking us in. We’re sort of falling downhill gravity-wise into this nearby supercluster. Fraser: Let’s get a sense of scale then. We have say 50 galaxies in our local group, how big is the Virgo supercluster? Pamela: The Virgo supercluster is actually big enough that if you scroll a telescope across that section of the sky you will see about a hundred galaxy groups and clusters that are part of this super cluster. It is us, the Virgo cluster itself. There are other things like the Earth’s major group that are falling into it. There is the M 101 group. All of us together make up the Virgo supercluster. Fraser: Can I grab a telescope and see it? Pamela: Yes and that’s one of the cool parts. You can actually go outside and see lots of superclusters. The Virgo supercluster is probably one of the most dramatic with the Virgo cluster within it. You can also go out and you can easily see the Coma cluster. Galaxy clusters are big enough that they can appear as easily recognized high numbers of galaxies in a concentrated region on the sky in photos and just by sweeping your telescope across the sky. Just like the Hyades cluster appears as a definitely much denser region of stars, the Virgo and Coma clusters appear as obviously much denser regions of galaxies. You just need a bigger telescope to see a cluster of galaxies because they’re faint. Fraser: Right. So most of the galaxies that we can see are part of the Virgo supercluster? Pamela: Yes, that’s one of the coolest things is we’re all basically falling together and we’re all part of one large city of galaxies. Fraser: Right, now is the Virgo supercluster part of something even bigger? Pamela: This is where we’re trying to figure out how you name things. The Virgo supercluster itself is the corner of where a bunch of different walls come together. Our universe has evolved over time from being pretty much a solid block. If you look back at what was the structure of the universe back in the days of the cosmic microwave background the density variations back then were very minute. The fluctuations that we see in cosmic microwave background are just one part in thousands. As we look today we end up seeing these huge voids of basically nothing in these really dense walls, these really dense superclusters where all of the mass has gravitationally been pulled together. Superclusters are where the different walls come together. The Virgo supercluster is just one place where all of these different walls come together. Fraser: Okay, I’m going to need some kind of an analogy. I’m thinking walls. Fraser: Swiss cheese? Bubbles, foamy bubbles. Pamela: Yeah when you go to the grocery store there are all sorts of different cheese with holes. There is cheese that has really tiny holes, the really cheap American Swiss. Then there is the lacy Swiss cheese. With the lacy Swiss cheese where a bunch of different bubbles are not quite touching at their corners you end up with a lot more cheese. Then there is the wall between two bubbles and then you end up with a junction of four bubbles. That gives you more cheese at the junction of four bubbles. Fraser: Okay so the holes are the air pockets, right? So that’s the voids that we have in the universe. Then the cheese [laughter] is the galaxies. How big are those voids then? Pamela: The voids can be absolutely huge. Just to give you some perspective before jumping in to the size of the voids, our own Milky Way galaxy is about 100,000 light years from edge to edge. That’s its diameter. Andromeda, our nearest giant neighbor is about 2 1/2 million light years away. The Virgo supercluster is way bigger. It is 110 million light years across. A void, a small void not a giant void, just an average run of the mill local void is 200 million light years in emptiness. Pamela: Nothing. They start looking and they might find like one or two lonely galaxies inside of them but these are giant empty spaces. Two hundred million is a small one. They can be two or three times this size. We’re finding the supervoids are more like 400 million light years side to side of pretty much absolutely nothing. So we went from a universe that was pretty much one continuous blob of stuff with very slight, slight irregularities in the distribution of matter. The slight places where there is a little bit more were able to gravitationally grab on to the stuff around them. The places that were a little bit less, they just sort of gave up and let themselves be torn apart gravitationally. The places with less have gotten less and the places with more have gotten more. In the universe, he who has more gets more. It’s kind of unfair. Fraser: It’s like the rich get richer, right? Fraser: The poor get poorer in terms of space. Pamela: Gravity doesn’t understand Robin Hood. Fraser: So let’s see if I understand this. Way back, right at the big bang there were these fluctuations in density of the newborn universe. Those fluctuations in density have been expanded for billions of years so that now we have voids. Pamela: It’s just the very slight fluctuations that we see in the cosmic microwave backgrounds that these inhomogenaties at the level of one in 10,000ish. It’s this slight inhomogenaties that have led to everything we see today. Fraser: Do we know why there were those differences? Pamela: This goes back to I think we actually covered this in an earlier show where there was basically sound waves moving through – and sound waves has a very physical meaning. Sound waves are when you have compression waves moving through a medium. There were essentially sound waves moving through the early universe. The different wave lengths of those waves got frozen out where you ended up with slight over-densities and slight under-densities. It’s much more complicated then that but that’s the simplest way of looking at it. We had waves traveling through the earlier medium and those waves got frozen out as places with higher densities and lower densities. Fraser: Right, I can imagine waves going across the ocean if you suddenly froze the ocean and then measured the thickness of the ocean you would have places that were thicker. You would have places that were thinner just because of where the waves were at that moment. Pamela: In this case it is much more like measuring the density in the air where complex notes are being played by an orchestra. All those different sounds that you’re hearing have different wavelengths and those get frozen out. Fraser: And then the rich got richer and the poor got poorer for billions of years until here we are today. Fraser: Alright then if I was to sort of pull way back out and just see the whole universe? Pamela: You can sort of do this locally with the Sloan Digital Sky Survey. Fraser: Right so how many of these voids would I see? How long would these walls be? Pamela: What’s neat is we can actually watch the growing of the structure because as we look further and further back we’re able to see further back in time. Light takes a finite amount of time to get from point A to point B. When we look at nearby things we can measure tens of different voids. We can measure tens of different superclusters. As we look further back in time at objects that are further away and their light is taking longer and longer to get to us we start seeing fewer and fewer superclusters. We start seeing fewer and fewer clusters themselves. The clusters get smaller. There have always been giant clusters. Some of these giant clusters formed in the first billions of years of the universe but they’re continuing to grow. They’re continuing to build and their numbers are growing over time. While we see tens of voids the numbers and sizes of the voids drop out as you look back in time. The numbers and sizes of the superclusters drop as you look further back in time. We can actually see our universe evolve. Fraser: I guess the voids increasing are where you’ve got these walls of galaxies and at some point they snap because of the universe. A galaxy has to make a decision to either go left or right. It’s either going to stick with these buddies or go off with those buddies and then you get a new void appearing in-between and those voids get expanded. Pamela: One of the things as we turn the clock forward is this process that you just described is going to make our universe go from simply being this lacy foam to actually being nothing more than isolated islands of galaxies. They are eventually basically going to turn into isolated galaxy as things cool off with time. Fraser: That was my next question is how is this all going to turn out? Run the clock forward as you said new voids pop open they become isolated collections of galaxies these superclusters. Then you’re saying they become galaxy? Pamela: Right. We’re still working on the details of the model. What’s really cool is we can actually watch these systems that are already held together to the point that the expansion of the universe has no bearing on the galaxies involved in superclusters. They’re gravitationally held together. Their separations are caused strictly by what their orbital size is as they orbit round and round the center of the supercluster. Over time galaxies will sweep past each other and gravitationally glom on to each other or material will get stripped out of galaxies. There’s this whole language that is rather violent involving galaxies. We talk about galaxy harassment where two galaxies sweep past each other. They’re moving fast enough that they don’t actually merge into one new system but the gravitational pull of the one galaxy on the other is able to grab some stars. It is able to grab out gas and trigger star formation. Once that star formation is over what might have previously been a nice healthy galaxy is now a dead elliptical system. We have what we talk about as ram-pressure stripping. As a galaxy falls into one of these superclusters it hits all the material that has been stripped out of galaxies that fell in earlier. As it hits this material it is like getting sandblasted except at the gravitational and pressure levels. You have these systems that aren’t gravitationally able to hold on to their gas and dust in the face of getting knocked by the material that it is falling into. In some cases the knocking triggers star formation again. You have these complex tidal tails star formation going on. It’s quick and when it is over the systems are dead. You don’t find star formation in giant superclusters at the same rate that you find it in smaller systems like our own local group. Fraser: I guess we can already see the future of some of these superclusters. There are some monstrous galaxies with trillions of times the mass of the Milky Way right at the heart of these galaxy clusters. Fraser: Yeah, they’ve already pulled away so many galaxies and torn them apart and added them to the mass. Eventually I guess they all have to have their time to meet [laughter] their final destination with whatever is the big elliptical galaxy at the core of the galaxy cluster. Is that what astronomers think then? In the end there will just be in each of these superclusters one big galaxy? Pamela: The question is just how far do you evolve the clock and at what point do you say I have a bunch of black holes or I have a bunch of galaxies. Over time you’re going to have the gas and dust getting used up in star formation getting knocked out into the inner cluster media. You end up with the cluster itself having this thicker and thicker gas that is orbiting outside of any specific galaxy settling toward the center. It’s so hot that it doesn’t all compact down and form something nice and small and compact in the center. As you have these galaxies harassing each other they shred each other. Given enough time they merge together and merge together more. At the same time you have the stars are dying in the galaxies. You have the systems themselves the stars are turning off over time. At what point do you say I now have a bunch of dead stars and black holes, this really isn’t a galaxy anymore and I have a system that is filled with more gas than stars and dust. It’s a matter of what do you name these future entities. I’m not sure anyone has sat down and looked at the models trillions of years in the future and said I’m going to stop calling a supercluster a collection of galaxies and start calling it a collection of dead compact objects. Fraser: We should come up with a name then. [laughter] Listeners, now is your chance. Hurry, we’ll write a paper. We’ll claim the name. Pamela: I think mostly astronomers are worried about trying to figure out things that have happened in the past. Our models say, yes everything is falling into superclusters. We haven’t really started to worry about how superclusters die. Fraser: This is going to be completely out of left field, but what’s a great attractor? Pamela: If you go outside and you turn on your microwave eyes and then decide that you’re gong to go into orbit because you can see the microwave much better in that direction. Fraser: That’s easy we do this all the time. Pamela: Right and things like Planck if it launches successfully tomorrow, and the Wilkinson Microwave Anisotropy Probe in the past make very good measurements of the cosmic microwave background. When we measure our motion relative to the cosmic microwave background we can go aha we’re going in that direction because of Doppler shifting. We see light in one direction is shifted toward the red. Light in another direction is shifted toward the blue. It’s nice in opposite sides of the sky so we know we’re traveling in the direction that we see the light shifted toward the blue. When we add up all the motions that we know about, when we add up the motion of the sun around the center of the galaxy, when we add up the motion of the galaxy relative to the local group. When we then start looking at the motion of the local group what we find is we’re headed in a direction that is blocked out by the disc of the Milky Way. We’re not quite sure what we’re headed toward. We think this is a combination of both giant chunk of mass that direction and giant void of mass in the opposite direction. A lack of mass will cause you to go toward the direction of a perfectly average pile of mass because your forces aren’t balanced. It’s not anti-gravity but it’s a lack of gravity and it kind of has the same effect. Fraser: Whatever it is that we’re actually being attracted towards, we can’t see it. It is like driving down the highway with your front windshield blacked out. The disc of the galaxy is blocking in the sky. Do astronomers have any idea? Pamela: We think that part of this motion is probably caused by what is called the Shapley supercluster. This is a giant, giant collection of galaxies that is off in the direction of the Centaurus constellation. We think that that’s part of the cause. There is also a void that was identified a couple of years ago in the opposite direction that we think is another part of the cause. There’s probably still more mass waiting to be discovered that’s hiding behind the dust and gas that makes up the plane of the Milky Way. We just can’t see what galaxies are beyond the area our Milky Way is obscuring. Fraser: I guess it’s only been in the last few years that astronomers have had a lot of the technology to be able to peer right through the Milky Way, right? I mean x-rays. Fraser: Yeah and I know that astronomers have been putting together surveys of galaxies and clusters and stuff on the other side of the Milky Way using Chandra and that kind of thing. Pamela: One of the problems is Chandra only allows us to see the biggest clusters of galaxies and the nearest clusters of galaxies. Those are the only ones that have enough mass to be generating enough hot gas that it emits x-ray light. We’re also looking in the infrared. Infrared can also pierce through the dust. We’re looking in the radio. It’s by combining all of this different data. Now of course there is stuff that gives off light in the infrared in the disc. There is stuff that gives off light in the radio in the disc. No matter what happens it’s always going to be hard. We have no completely transparent band that allows us to look through all of the stuff in the disc of the Milky Way. Fraser: There isn’t any need for a kind of scary pseudoscience description of what the great attractor is? Pamela: No it’s simply that there is something big over there and we’re falling toward it. That’s okay, we understand how that works. Fraser: This is one of those situations where our position is not in our favor. Pamela: Sometimes chance alignments happen. Fraser: Are there any missions out there that you think will really help us understand the large scale structure of the universe? Pamela: The James Webb Space Telescope is definitely going to help us understand the evolution of the large scale structure. The Sloan Digital Sky Survey and the future Large Synaptic Survey Telescope – the LSST are both going to play major roles as well. What’s happening right now with the Sloan Digital Sky Surveys, there is a robotic telescope out in New Mexico that is systematically looking at the sky both taking regular images that hopefully lots of you have looked at in Galaxy Zoo. If you haven’t, go to galaxyzoo.org. They’re measuring as well as what does the galaxy look like through photographs, they’re also taking spectra and measuring the red shifts. This allows us to figure out the distance to these galaxies. By combining all of this different information they’re making amazing 3-dimensional pictures of what the nearest billionish and beyond that but with decreasing numbers of sources. You start looking at quasars to measure the density of the universe. 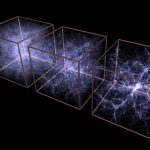 They’re working to build detailed 3-dimensional maps of first our Milky Way using stars, then the nearest part using all the galaxies and then the more distant parts using quasars. Sloan Digital Sky Survey is going to keep going deeper. They’re going to keep looking at different types of details with different surveys. We have in the future the Large Synaptic Survey Telescope coming onboard which is going to take image after image of the sky. Over time you can add those together to get deeper and deeper images. James Webb space telescope is not a survey telescope but it’s going to allow us to over time take the equivalent of the Hubble deep field but in the infrared giving us an even deeper view of our universe, a narrow cone of understanding. Fraser: It’s the time machine idea where James Webb is going to be looking right back to hundreds of millions of years. Pamela: Exactly, the very first objects. Fraser: Yeah, after the universe formed and really watch as those differences in density started to turn into the big galaxy clusters that we see today. Pamela: You can go out and see both sides of this in both real data and in models. There’s a fellow down in the University of Hawaii, Josh Barnes who has done some amazing movies of how do galaxies merge. If you want to see how galaxies self-destruct he has models that do that. There are all sorts of different videos on how does large scale structure evolve over time. There are Sloan Digital Sky Survey fly-through movies that allow you to go from right there on the mountain peak in New Mexico zooming out to the Milky Way, zooming out to the local group, and zooming out to the quasars that are at the edge of the survey. You can fly through our understanding of the universe. Fraser: Awesome. I think that wraps up the biggest there is. Thanks Pamela. If the redshifting in light indicates that all objects are expanding away from us indicating the big bang and the existence of dark matter then how do galaxies and super clusters collide and subsume each other. I know gravity and three body interactions are happening but where is the expansion . This process hints at ultimately everything that can merge will and over eons the voids will get bigger. Given that gravity radiates at light speed (still thought to be true I believe) how do large scale structures maintain structure? It could take a goodly percentage of their age just to propagate gravitational field changes across the structure. I’ve never heard a really coherent discussion about how the universe maintains structure with gravity only moving at light speed. As Steve in NC says and no one challenge: gravity radiation spreads at c speed. All codes simulating the evolution of the universe took the Newtonian approximation of infinite c speed. homogeneous, infinite, euclidean, not expanding, no DM, no DE. I remember that GR was put forward when it was consensual that the matter has an infinite age and gravity was already ‘set’ in the universe. Only later was acknowledged the finite age of the matter and of the gravity, but never translated into the GR formulation. I’m no expert, like Dr. Gay. But a big mystery in physics today is the one of “gravity waves” and how do they propagate? They are not assumed to “move” at the speed of light. But physicists do not know how or even what they are. Or how does gravity “propagate”.